Launching a rocket, designed and built by you and your team mates, hundreds of feet into the air, with nothing but a streamer to ease it’s fall back down, without breaking the fragile egg inside can be a difficult trial and error process that many rocket club students enjoy. 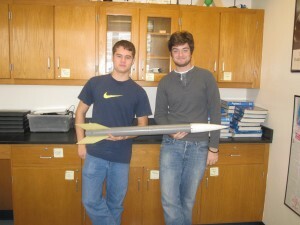 Rocket team has been open to Penn Manor students for eight years now. The students in rocket club get together, usually in teams of three, and design a rocket on the computer, and then test it in a simulation. After designing the rocket, the students then begin to construct, launch and make adjustments to their rockets. Before qualifying, the teams practice 25-35 times at Manor Middle School field. To qualify for nationals, a team’s rocket must launch at least 825 feet high, and land within 40-45 seconds. Although this can be a challenge to meet these requirements, many of the students, from freshmen to seniors, find this a fun experience. Osmolinski has been the rocket club advisor for almost four years now, and he has seen a wide-range of students learn and enjoy this club. “The most beautiful thing about it is that anyone can do it, everyone gets something out of it,” said Osmolinski. Jordan Franssen and Ivan Puskavoic show off one of the models they constructed for rocket club. Rocket club raises about $6000 from the Thursday snack carts. They also receive some of their funding from some of the Raven’s home games, and they apply for grants.